Gold has conducted what some are calling a “stealth rally” over the past month. After bottoming at $1,206 per ounce on July 10, gold is at $1,286 this morning, a healthy 6.5% gain in just over one month. The has been welcome relief for gold investors after a series of “flash crashes” on June 14, June 26 and July 3 contributed to a gold drawdown from $1,294 per ounce to $1,206 per ounce between June 6 and July 10. At that point it looked as though gold might fall through technical resistance and tumble to the $1,150 per ounce range. But the new rally restored the upward momentum in gold we have seen since the post-election low on Dec. 15, 2016. Gold seems poised to resume its march to $1,300 after the paper gold bear raids of late June. In other words, the physical supply situation is tight as a drum. One of the flash crashes was precipitated by the instantaneous sale of gold futures contracts equal in underlying amount to 60 tons of physical gold. The largest bullion banks in the world could not source 60 tons of physical gold if they had months to do it. August and September are traditionally strong seasonal periods for gold. This is partly due to proximity to the wedding and gift season in India, when strong buying prevails. Yet there’s more to the gold demand story this year. The countdown to war with North Korea has begun. A U.S. attack on the North Korean nuclear and missile weapons programs is likely by mid-2018. The stock market may not have noticed, but the gold market has. This is part of the reason for recent gold strength. Finally, we have to deal with our friends at the Fed. The strong jobs report on Friday, Aug. 4, gave life to the view that the Fed would raise interest rates at least one more time this year. Rate hikes make the dollar stronger and are a head wind for the dollar price of gold. But the Fed will not hike rates again this year. Once the market wakes up to the reality of a prolonged “pause” by the Fed, they will conclude correctly that the Fed is once again attempting to ease by “forward guidance.” This relative ease will keep the dollar on its downward trend and be a boost to the dollar price of gold. The Fed will not hike rates regardless of the strong jobs report. The reason is that strong job growth was “mission accomplished” for the Fed over a year ago. Jobs are not the determining factor in Fed rate decisions today. The determining factor is disinflation. The July data will not be available until early September. There’s no chance of this happening before the Fed’s September meeting. It’s unlikely to happen before December, because of weakness in auto sales, retail sales, discretionary spending and consumer credit. A weak dollar is the Fed’s only chance for more inflation. The way to get a weak dollar is to delay rate hikes indefinitely, and that’s what the Fed will do. Current levels look like the last stop before $1,300 per ounce gold. After that, a price surge is likely as buyers jump on the bandwagon, and then it’s up, up and away. Geopolitical risks are piling up from North Korea, to Syria, to the South China Sea and beyond. The failure of the Trump agenda has put the stock market on edge and a substantial market correction may be in the cards. Acute shortages of physical gold have set the stage for a delivery failure or a short squeeze. Get ready for an explosion to the upside in the dollar price of gold. 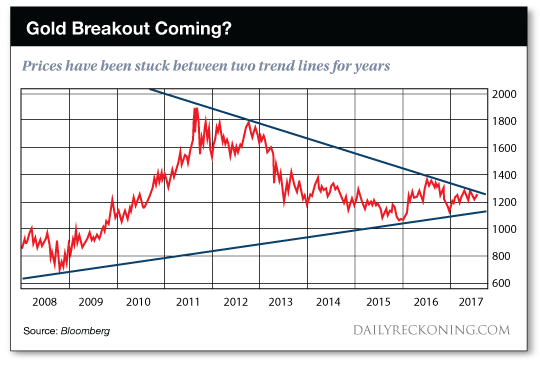 Make sure you have your physical gold and gold mining shares before the breakout begins. 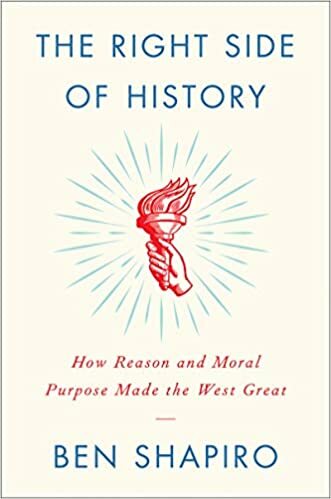 In best-selling author Jim Rickards’ latest book, the New Case For Gold, he brings up one of the most common criticisms of a new gold standard – that there is not enough gold to support it. Rickards makes the argument that it would work at a certain price level. In his interview with Kitco News, Rickards also discusses China and gold buying. He suggests that China is suppressing the gold price through the COMEX market in order to build-up more physical supplies. Once they have a sufficient supply, equal to the United States, they will no longer care what the metal's price is and it will likely skyrocket, he explains. The cryptocurrency craze continues with the leading virtual currency — Bitcoin — trading near record highs. But, to bestselling author and currency expert Jim Rickards, the new age currency may be in a bubble. Delving into the theory of valuation, the Currency Wars author said that even if investors seem to be expressing a liquidity preference for Bitcoin over the dollar, it doesn’t necessarily mean they are losing confidence in the greenback. ‘If you were losing confidence in the dollar than gold would be going up and it’s not, so it looks like a bubble,’ he told Kitco News. Visa recently unveiled its own offensive in the war on cash. Visa is offering certain merchants a $10,000 reward if they refuse to accept cash in the future. These private efforts by Visa and MasterCard exist side by side with official efforts to eliminate or discourage the use of cash coming from governments in India, Australia, Sweden as well as the United States. These efforts are always portrayed in the most favorable light. Private parties talk about convenience and lower costs. Governments talk about putting pressure on tax cheats, terrorists and criminals. Governments always use money laundering, drug dealing and terrorism as an excuse to keep tabs on honest citizens and deprive them of the ability to use money alternatives such as physical cash and gold. 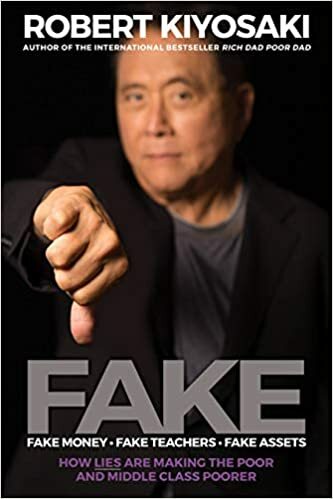 But the so-called “cashless society” is just a Trojan horse for a system in which all financial wealth is electronic and represented digitally in the records of a small number of megabanks and asset managers. Once that is achieved, it will be easy for state power to seize and freeze the wealth, or subject it to constant surveillance, taxation and other forms of digital confiscation. Last year the European Central Bank announced that they were discontinuing the production of new 500 euro notes. Existing 500 euro notes will still be legal tender, but new ones will not be produced. The real burden of the war on cash falls on honest citizens who are made vulnerable to wealth confiscation through negative interest rates, loss of privacy, account freezes and limits on cash withdrawals or transfers. The war on cash is a global effort being waged on many fronts. My view is that the war on cash is dangerous in terms of lost privacy and the risk of government confiscation of wealth. India provides the most dramatic example. How would you like to go to bed one night and then wake up the next morning to discover that all bills larger than $5.00 were no longer legal tender? That’s essentially what happened in India not long ago. The good news is that cash is still a dominant form of payment in many countries including the U.S. The problem is that as digital payments grow and the use of cash diminishes, a “tipping point” is reached where suddenly it makes no sense to continue using cash because of the expense and logistics involved. Once cash usage shrinks to a certain point, economies of scale are lost and usage can go to zero almost overnight. Remember how music CDs disappeared suddenly once MP3 and streaming formats became popular? That’s how fast cash can disappear. Once the war on cash gains that kind of momentum, it will be practically impossible to stop. That’s why I’m always saying that savers and those with a long-term view should get physical gold now while prices are still attractive and while they still can. Given these potential outcomes, one might expect that citizens would push back against the war on cash. But in some places, the opposite seems to be happening. A recent survey revealed that more than a third of Americans and Europeans would have no problem at all giving up cash and going completely digital. Specifically, the study showed 34% of Europeans and 38% of Americans surveyed would prefer going cashless. Notably, Germans are the most resistant to going cashless. Almost 80% of transactions in Germany are done in cash, and many Germans never use credit cards. The German experience with hyperinflation after WWI and additional monetary chaos after WWII certainly plays a part in this resistance to the cashless society. Incidentally, the German word for debt, schuld, also means guilt. Other countries, such as Romania and Bulgaria, which have recent experiences with currency and financial crises, also tend to use cash extensively. Of course, there’s no denying that digital payments are certainly convenient. I use them myself in the form of credit and debit cards, wire transfers, automatic deposits and bill payments. The surest way to lull someone into complacency is to offer a “convenience” that quickly becomes habit and impossible to do without. The convenience factor is becoming more prevalent, and consumers are moving from cash to digital payments just as they moved from gold and silver coins to paper money a hundred years ago. 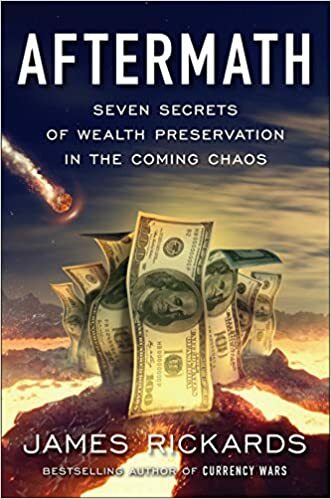 But when the next financial panic comes, those without tangible wealth will be totally at the mercy of banks and governments who will decide exactly how much of your own money you’re allowed to have each day. It will come to the U.S. soon enough. Other dangers arise from the fact that digital money, transferred by credit or debit cards or other electronic payments systems, are completely dependent on the power grid. If the power grid goes out due to storms, accidents, sabotage or cyberattacks, our digital economy will grind to a complete halt. That’s why it’s a good idea to keep some of your liquidity in paper cash (while you can) and gold or silver coins. The gold and silver coins in particular will be money good in every state of the world. I hold significant portion of my wealth in nondigital form, including real estate, fine art and precious metals in safe, nonbank storage. I strongly suggest you do the same. Jim Rickards chats about his latest book, the potential for future interest rate hikes and US President Donald Trump's steel probe. He also shares his advice for investors. 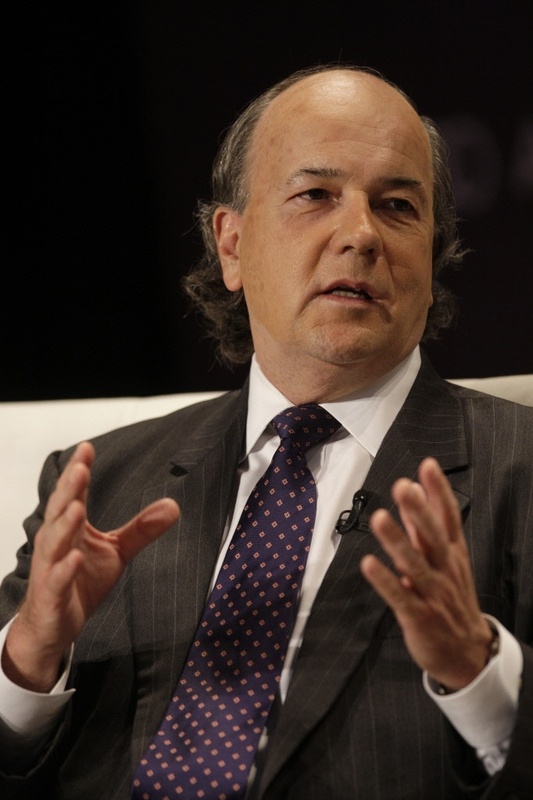 Gold prices have nowhere to go but up: Jim Rickards from CNBC. Gold prices stand to benefit as central banks continue targeting higher inflation rates, says Strategic Intelligence's Jim Rickards. Join Michael Pento and best selling author & National security expert Jim Rickards as they discuss North Korea, debt the stock markets and when this all unravels . Rickard's says "What Are You Waiting For, Get Your Gold Before Your Not Going To Get It Anymore". Gold was down after the Fed’s hike, but I expect it to start heading higher again. Too many powerful forces are driving it behind the scenes. Dwindling physical supply is a major one. Geopolitical fear is another. The crises in North Korea, Syria, Iran, the South China Sea, and Venezuela are not getting better. The headlines may fade in any given week, but geopolitical shocks will return when least expected and send gold soaring in a flight to safety. Fed policy tightening is normally a headwind for gold. But, the last two times the Fed raised rates — December 14, 2016 and March 15, 2017 — gold rallied as if on cue. In short, all signs point to higher gold prices in the months ahead based on Fed ease, geopolitical tensions, and a weaker dollar.